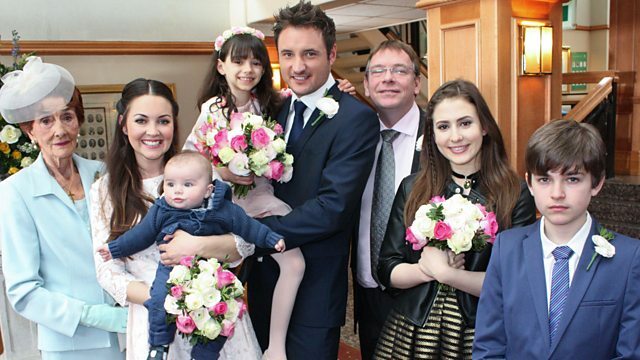 Stacey and Martin's wedding day has finally arrived, but will they get the wedding of their dreams? Sharon does her best to help Phil, but will he accept her support? It’s the day of Martin and Stacey’s wedding and Martin wakes to see Stacey crossing the Square to lay flowers for Peggy. On her return, Martin tells Stacey that Ollie has slipped a disc – he and Jean won’t be making it today. Martin tells Stacey that it’s fine if she still wants to postpone the wedding, but Stacey’s adamant that she wants to marry him today. Belinda arrives to get Stacey ready for the wedding. All ready for the day ahead, Martin and Stacey emerge from their house looking happy and in love. Kush comes over to take some pictures for Martin and Stacey - Martin is reluctant but relents and invites Kush to capture their day. At the venue, Dot gives a biblical sermon to the wedding guests and the happy couple tie the knot. The wedding party return to the Vic - Stacey throws her bouquet and Kathy catches it - she glances over towards Buster who smiles. When Kyle leaves and heads back to the flat to pick up his wallet, he finds some of Andy’s paperwork including cuttings from a newspaper with a picture of Danielle. Andy comes out of the shower and catches Kyle with the cuttings. Kyle quizzes Andy about the girl in the picture but to no avail. Stacey takes Martin up to the roof of the Vic and tells him how he has got her through the bad times. They look down on the Square below and share a kiss. Phil walks through the Square - feeling everyone watching him. As he takes Ben and Louise to the Café for breakfast, Sharon calls him but he ignores her call. Later, Ben meets Jay in the park; Jay is struggling being away from him. It’s emotional as they embrace. Sharon goes to see Phil at the Arches - she’s worried about him and invites him home. Shirley phones Phil – he ignores the call. Sharon takes Phil home and fusses over him. Dot arrives to pay her respects and tells Phil that she has a feeling that Peggy took her own life. The family liaison officer arrives to see Phil - she asks Sharon if she is family – Sharon tells her she is his wife and she will be staying. The family liaison officer tells Sharon and Phil that the coroner has ordered a post mortem for Peggy. Phil thanks Sharon for helping him and heads off to the Vic. In the Vic, Shirley tells Phil how sorry she is about Peggy – she’s floored when Phil admits that Peggy took her own life. Shirley is shocked and vows not to say anything. Phil goes to see Sharon and bravely tells her it’s time to let go - she asks him to stay and they embrace. In the Vic, Shaki arrives and chats up Bex - Louise comes in and sees them kissing; she’s not pleased. Sharon sees Jane’s damaged car in the Square and takes the broken wing mirror to Jane. Bobby goes to the Café and tries to talk to Ian, but Ian is too busy organising the wedding. As Bobby heads home, he sees Dennis on his bike, who shouts out to Bobby that he is a posh boy. Bobby is in a bad mood; Jane questions Bobby’s behaviour and is shocked when he tells her he’s not sad that Peggy has died. Bobby stomps off upstairs to get changed; he comes down in his school uniform. Bobby steals money out of Jane’s purse. She is unaware and tells Bobby how proud she is of him.